Calderas are large craters formed by volcanic explosions or by unsupported surface rock collapsing into empty magma chambers beneath the ground. They sometimes are referred to as supervolcanoes. One way to understand calderas is to think of them as reverse volcanoes. Volcanic eruptions often will be the cause of magma chambers being left empty and leaving the volcano above unsupported. This can cause the ground above, sometimes an entire volcano, to collapse into the empty chamber. Yellowstone Park is perhaps the most well-known caldera in the United States, drawing millions of tourists every year. According to Yellowstone's website, the supervolcano was the site of massive eruptions 2.1 million years ago, 1.2 million years ago, and 640,000 years ago. Those eruptions were, respectively, 6,000 times, 70 times, and 2,500 times more powerful than the 1980 eruption of Mount St. Helens in Washington. What today is known as Lake Toba in Indonesia is the result of perhaps the greatest volcanic eruption since the dawn of early man. Approximately 74,000 years ago, Mount Toba's eruption produced about 2,500 times more volcanic ash than Mount St. Helens. This led to a volcanic winter that had a devastating effect on the entire human population of the time. The volcanic winter lasted six years and led to a 1,000-year-long ice age, according to research, and the world population was reduced to about 10,000 adults. 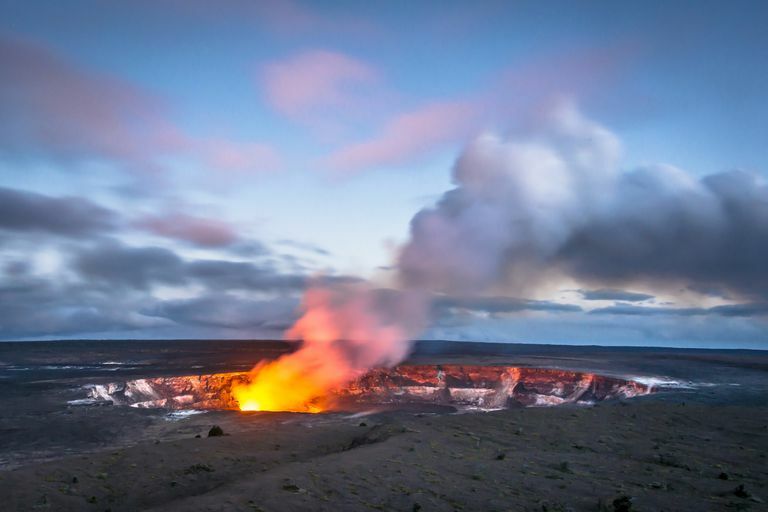 Research into how a massive eruption would impact the world day shows the effects to be potentially devastating. One study focusing on Yellowstone suggests another eruption comparable in size to three biggest ones of the past 2.1 million years would kill 87,000 people instantly. The volume of ash would be enough to collapse rooftops in states surrounding the park. Everything within about 60 miles would be destroyed, most of the western United States would be covered in about 4 feet of ash, and an ash cloud would spread across the entire planet, casting it in shadow for days. The impact on vegetation could lead to food shortages across the planet. Yellowstone is just one of many calderas throughout the world. Like Yellowstone, many of the others can be interesting and fascinating places to visit and to study. * Ma is 1 million years ago, ka is 1,000 years ago, Pliocene is 5.3-1.8 Ma, Quaternary is 1.8-0 Ma. 1 Yellowstone and Longridge are the ends of a chain of several large calderas extending beneath the Snake River Plain, each comparable in size. 2 The Russian calderas are informally named here for the smaller modern calderas and active volcanoes that lie within them.